Ultra-private, ridiculously handsome Crown Prince Arthur has always gotten by on his charm. But that won’t be enough now that the Royal Family is about to be ousted from power once and for all. When Prince Arthur has to rely on the one woman in the kingdom who hates him most, he must learn that earning the love of a nation means first risking his heart. Twenty-eight-year-old Tessa Sharpe, a.k.a. The Royal Watchdog, hates everything about Prince Arthur. As far as she’s concerned, he’s an arrogant, lazy leech on the kingdom of Avonia. When he shocks the nation by giving her the keys to the castle, Tessa has no choice but to accept and move in for two months. It’s lust at first sight, but there’s no way she can give in to her feelings—not if she wants to have a career or a shred of pride left when her time at the palace ends… Can two natural enemies find their forever in each other’s arms, or will they ruin each other to save themselves? Tessa Sharpe (The Royal Watchdog) is a blogger that writes dreadful things about the Royal Family. She shames them because she doesn’t think the country needs a Royal Family. So, she writes about it in her blog. She has a large following and she has the capacity to impact the public’s view of the royal family. Prince Arthur, being under the gun, devises a plan and invites Tessa to the castle to stay for a couple of months. He wants to persuade her and make her understand that having a Royal Family is actually beneficial to the country and necessary. Tessa accepts and the two enemies are now living together in the same palace. What ensues is a hilarious romantic comedy that will keep readers engaged and happily turning the pages. As the story progresses, readers can feel the extreme heat between Tessa and Prince Arthur. The Royal Treatment is unpredictable, with no loose ends. It is a total gem. It is intelligent, unforced, and very plausible. Tessa is clumsy and endearing, Melanie Summers put in just the right amount of wit and magnetism to keep readers engaged and believing the story line. With likable quirky characters that are fully developed, I fell in love with almost all of them. Some were not so likable, keeping the story grounded – and funny. Although it is a fairytale type story it seemed totally realistic and plausible. Tessa is cute, and awkward but also strong and smart. Prince Arthur is so charming that he even charmed my pants off. The character development is superb, while author Melanie Summers rolls out each character as the story line progresses. You get to know and love each of the eccentric adorable characters as the book advances-extremely good writing. The Royal Treatment is fast paced but not rushed. Melanie Summers seemed to have taken her time coming up with and writing this laugh-out-loud romantic comedy. 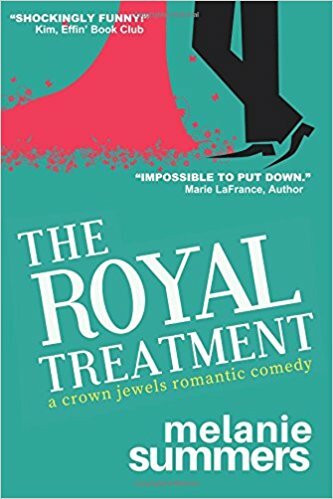 I know they say that “you can’t judge a book by its cover,” but that’s exactly what I did when I saw The Royal Treatment book cover. I loved it and I loved the story within the pages. The storyline flows seamlessly together with no errors or editing issues. The book is light hearted and intelligent while keeping with the LOL rom com genre. There is plenty of drama, fun and romance and a ton of laugh out loud comedy. The Royal Treatment is a quick and easy read with an in depth, well thought out plot. It’s perfect for someone that needs a break from this world and wants to delve into a modern day fairy tale that will keep them laughing and rooting for the main characters throughout the story.